May 20th marks the start of a week to celebrate, recognize, and promote the importance of public works and the impact it has on our daily lives. Communities will spend time throughout the week taking different approaches to encourage the public to engage and understand “The Power of Public Works” and how it improves our quality of life. This will appear in the form of a proclamation, educational pieces, interviews, social media postings, and holding events. No recognition, post, or activity is too small to spread the word about how important public works is! The Minnesota Chapter would love to hear about how your community celebrated the week. If you are willing to share what you did (a brief write-up, links to website/social media posts, or photos), please send to admin@apwa-mn.org. Writer's block? No time? Lacking creative idea generation? The National Chapter provides great resources, ideas, and a video that can easily be used by communities to promote Public Works throughout the week. The Minnesota Chapter encourages you to work with your community and share this information! 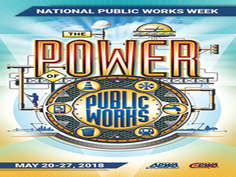 Our local chapter has also taken time to draft a press release and template for members to use to promote National Public Works Week in their communities.